How to Sign Up: Email jcbarrestudio@gmail.com to reserve your spot. **Pre-registration required! The instructors will not be able to take cash payments at the door. 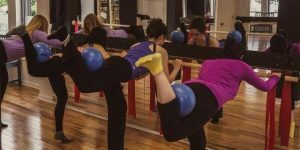 Description: JC Barre’s signature class. Pilates, Ballet and Yoga combine to create a full body cardio workout. Use resistance bands, balls and weights. Leave feeling longer, stronger and re-energized.